Housed in a historic 1930s mansion, Villa Ganz Boutique Hotel has been acclaimed as the first luxury boutique hotel in Guadalajara. It has 10 beautifully restored guestrooms, decorated exquisitely in a palette of earthy tones, and furnished with antiques, European furniture, and decorative Mexican artisan accessories. Amenities include a business center, complimentary WiFi, air-conditioning, and small pets welcomed. Guests can find picturesque corners and magical spaces in this two-story villa, which brilliantly evokes the noble mansions of yesteryear. 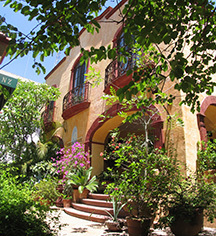 Villa Ganz is situated in the City of Roses’ lively Zona Rosa, or Pink Zone, in the heart of Colonia Lafayette. Along with the elegant Colonia Americana, the gorgeous Colonial architecture of the late 19th- and early 20th-centuries, with its distinctive European flair, is represented in these neighborhoods. The streets are lined with art galleries, restaurants, bars and pubs, museums, shopping centers, parks, and internationally acclaimed designer boutiques. The AAA Four Diamond and Fodor's Choice luxury boutique Villa Ganz is the choice lodgings for a tranquil and blissful Guadalajara getaway. Villa Ganz is just 10 minutes from the historic district and notable attractions nearby include Plaza del sol, the U.S. Consulate, and the Instituto Cultural Cabañas, a UNESCO World Heritage Site. Villa Ganz Boutique Hotel, a member of Historic Hotels Worldwide since 2016, dates back to 1930. Villa Ganz was a 1930s mansion built by the grandparents of Mexican golfer Lorena Ochoa, considered the best Mexican golfer and the best Latin American female golfer of all time. Housed in a historic 1930s mansion, Villa Ganz Boutique Hotel has been acclaimed as the first luxury boutique hotel in Guadalajara. It has 10 beautifully restored guestrooms, decorated exquisitely in a palette of earthy tones, and furnished with antiques, European furniture, and decorative Mexican artisan accessories. 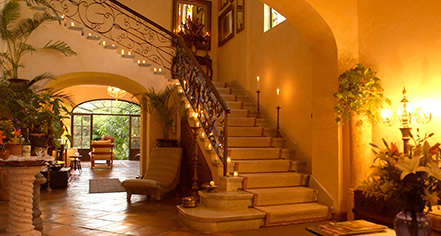 Learn more about the History of Villa Ganz Boutique Hotel .